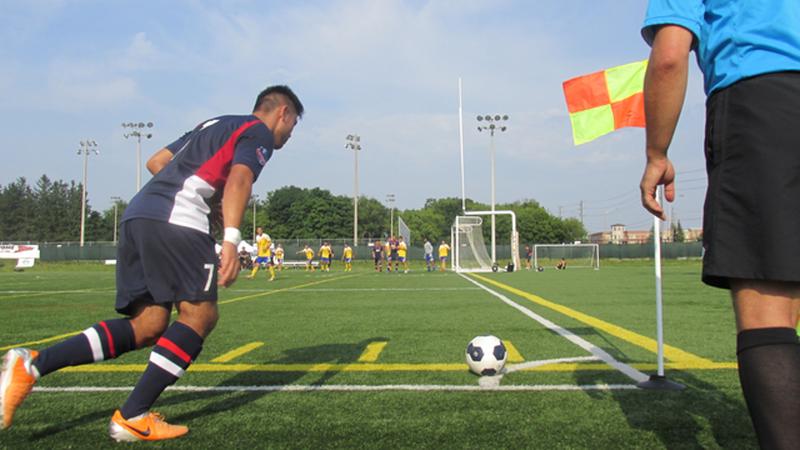 It took just a quarter hour for the Vaughan Azzurri to finish off the Kingston Cataraqui Clippers in League 1 Ontario Soccer action Sunday afternoon. Not long after they’d warmed up, the visiting Clippers found themselves two down, courtesy of a fine eighth-minute header from Vaughan striker Andrew Ornoch, and a seventeenth minute blast from Azzurri midfielder Jonathan Lao. The goals were the seventh apiece for the deadly duo from Vaughan. Whatever fight the Clippers had after coming two hours down the 401 for the match was sucked out of them as the contest became a one-sided affair, with plenty of missed chances for the Azzurri, due in large part to some outstanding play from Clippers' goalkeeper Navi Sidhu, and no scoring opportunities at the other end for Kingston. Lao, who had an excellent game, got on the end of a nice feed from Ornoch in the sixtieth minute to slot home his second of the match and eighth of the season to make the score 3-0. It held up as the final in a game that had little drama from start to finish. Lao is in second place in league goal-scoring, still five goals behind league-leader Molham Babouli of Toronto FC Academy, who has 13, but one ahead of Ornoch as well as Lerohne Young of Durham United FC, and Emery Welshman and Alex Halis of Sigma FC - all of whom have seven goals apiece. Lao was pleased with the performance of his team and the game’s outcome. “I thought it was good, we had a lot of possession, we were going forward,” said Lao. He gave credit to Ornoch, with whom he has developed a nice partnership. “He reads the game well and he’s a good player. It’s easy to play with him,” he said. Lao said goals are nice to get but the midfielder enjoys contributing in whatever manner helps the team win. “I’ve always played midfield, I like to help the team and get the assists, but if a goal comes around, why not,” said Lao. The victory puts Vaughan into second place after ten games played with twenty-two points, just two behind leaders TFC Academy, also with ten games played, and a point above third-place Sigma FC, who have played eleven games. Woodbridge Strikers are fourth with sixteen points, but have played just nine games. Vaughan assistant coach Patrice Gheisar said on any given day any League1 side can beat any other, but admitted the real test for his club remains TFC and Sigma. “Those teams (TFC, Sigma) are the benchmark, games like this create bad habits. Sigma, TFC - those are the games that really test you,” said Gheisar. It’s a busy week for the Clippers, who hold last place in the nine-team league with just six points in eleven matches. The club is in Oshawa Thursday night at 8:30 p.m. for a Cup tie against Durham United FC and then travels all the way to Windsor to play the Stars on Saturday at McHugh Stadium at 7 p.m.
Vaughan don’t play again until Sunday, Aug. 17, when they have a home match at the Soccer Centre in Vaughan against Durham. It starts at 4 p.m.
©2019 League1 Ontario / SportsEngine. All Rights Reserved.